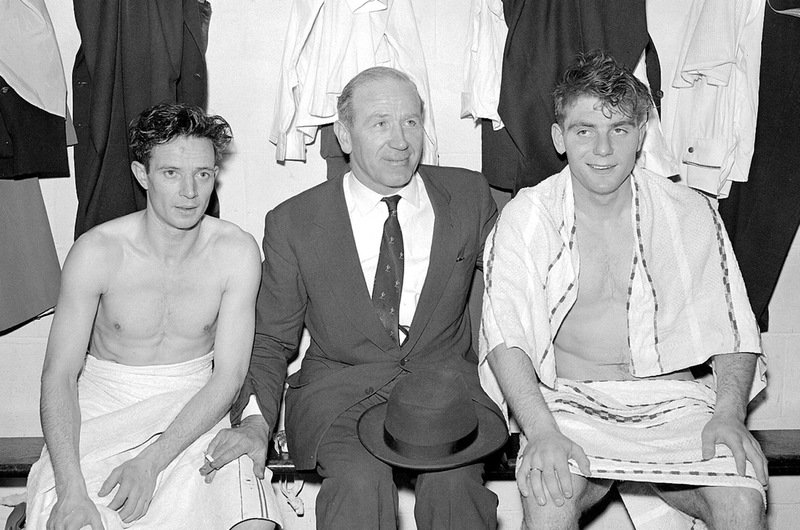 Manchester United manager Matt Busby between Johnny Berry (left) and Duncan Edwards (right), in the dressing-room at Bournemouth after United had qualified for the FA Cup semi final in March 1957. United reached the final that year, but lost 2-1 to Aston Villa. Less than one year after this photo was taken, all three men were victims of the Munich air disaster. Busby had to spend months in hospital, during which time he was read the last rites twice. Berry suffered severe injuries, including a fractured skull and broken pelvis – he never played football again and retired aged 31. Edwards, arguably the greatest talent England has ever produced, died of his injuries two weeks after the crash, aged 21. We’ll never know how great he might have been – those who saw Big Dunc were in awe of his all-round talent.